Vektor is an US technical thrash metal / progressive metal band. I haven't heard another album of this band, but this conceptual space techmetal album caught my eye. I don't listen to anything much louder dan Iron Maiden that often, but I do like Voivod, Devin Townsend's Ziltoid and Pestilence. 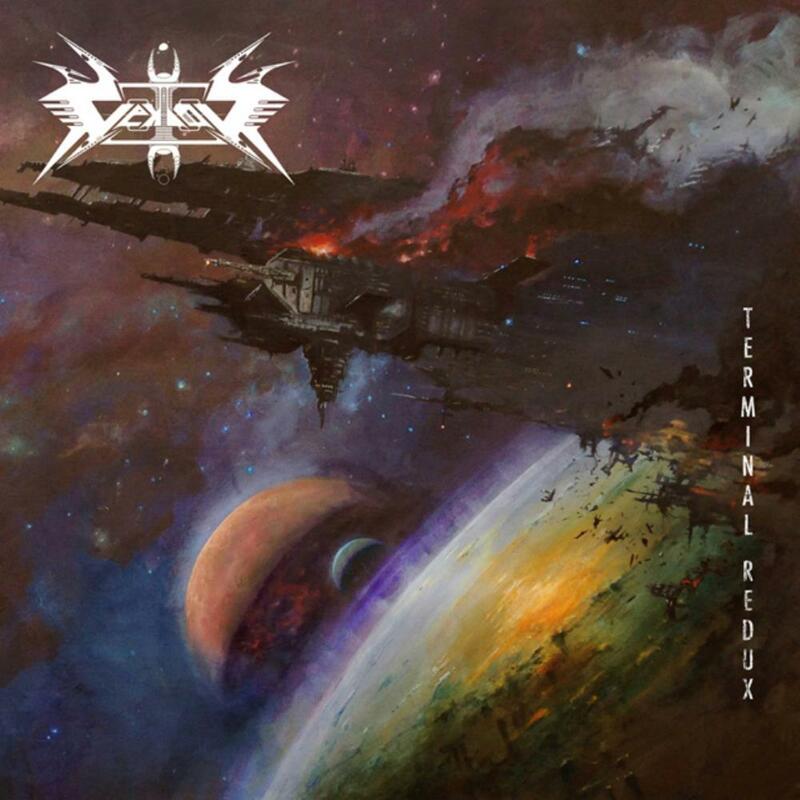 Vektor has a sound with a bit of every band mentioned here, but more fierce and speed death metal like. Furthermore, the vocals / grunts of David DiSanto are high-pitched and rasping in a way I never heard before. The guitars sound surprisingly mid- ranged for such a heavy record, which spares some room for bass-guitar in the mix. The album tells the story of a rising ruler in the Cygnus part of space. Aiming for a society that is orderly and endless he first wages war with 'technogenetic' weapons and more traditional space weapons. Ruling with advanced mind control techniques the ruler slowly becomes aware of himself again after being sucked up in his own lifeless mind controlled society. After that he decides to introduce change and transience - knowing it will lead to his own demise and the end of his empire. Life is incomplete without death. Every track on this seventy minute long 2lp is very technical and well written, but the real gems are in the beginning and the end. Charging The Void (9:11) and Cygnus Terminal (8:15) make up the first side with an endless stream of musical ideas and lyrics that work best together. When listening this album with the lyrics sheet it really 'opens up' so to speak. The music hasn't much space rock sounds, but when you get involved in the story you will start imagining galaxies and mind control devices. On the second and third side of the record the music gets into more 'regular' speed thrash death metal territories and I feel like the songs could have been a bit more concise. Still high quality playing, but it's not THAT easy to listen to seventy minutes of this kind of music. A bit more focus on melody and catchy parts would not hurt here. On side four Vektor treats us with two of the albums best songs. Collapse (9:22) starts of as a ballad type song. Yes it does, with clean vocals that remind me a bit of psych folk. The second part of the song has a lot of melodic death metal parts before being launched into the epic Recharging The Void (13:36) with some added female vocals and a great folky middle section. The lyrics on these two last songs form the philosophical crux of this concept album. The self-conscience and hopeful dive into self-destruction for the greater good makes up a great lyrical sheet for the intense ending. Conlusion. This music is probably too heavy and intense for most listeners, but I really like this album and I think the concept and the music work well together. Vektor creates an album with moments of true epical proportions and impact. It requires six listens (ast least one with lyrics) to get into it, but it's more then worth it for me! In this niche of progressive / metal music this one of the best albums ever made I guess. Four stars, but I might come back to add another star later.